Patient Satisfaction : Patient Experience :: Consumerism : Clinical practice ? 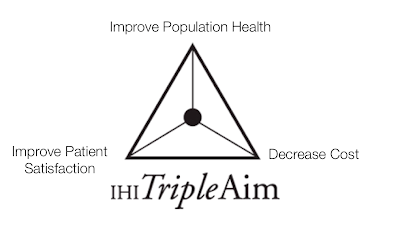 I am frequently corrected by my colleagues and mentors when I allude to patient satisfaction in the context of the Triple Aim. 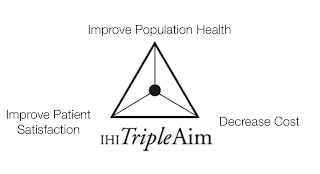 [Berwick] They promptly remind me that the Triple Aim refers to patient experience, which is an appropriate correction. Although precision is important in referencing literature, I purposely allude to patient satisfaction because it underscores a fundamental difference between consumerism and clinical practice. Although it is important to have the objectivity of experience surveys for comparison purposes, I think the subjectivity of patient satisfaction is essential for testing whether a healthcare product or service is solving a subjective problem for the patient. If healthcare is considered a product or service that a patient has a choice to purchase by exchanging a scarce resource like money, time or attention, then patient satisfaction may be a better measure of that exchange of value. Using patient satisfaction rather than patient experience opens the door for consumer-centric approaches to improve healthcare delivery and make it more patient-centric. Although I am cautious to misquote the Triple Aim and its relationship with patient satisfaction, I do so purposely to try to pickle our overly academic culture of patient care with patient-centeredness. Medically vulnerable populations, such as dually eligible patients, are predisposed to income disparities and have a relatively limited purchasing power. [Jacobson et al] The lack of purchasing power poses a challenge for expanding entrepreneurial innovations to vulnerable populations through business-to-consumer (B2C) sales models. There are ways to overcome the limited consumer purchasing power through business-to-business (B2B) sales models. And value can be indirectly distributed to vulnerable populations by selling to payers or provider organizations serving those patients. 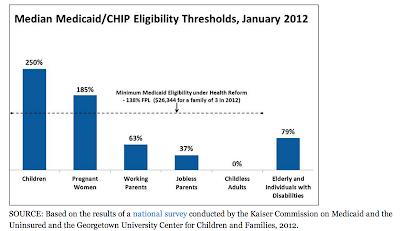 [Ostrovsky et al] The expansion of Medicaid eligibility criteria through the Affordable Care Act (ACA) may offer a rare opportunity for B2C sales models to thrive with vulnerable populations. The poor that did not quite meet eligibility criteria for Medicaid had to find other ways to cover medical expenses so they typically did not have the dispensable income to purchase a health app or a wearable device. Starting in 2014, the federal government will cover 100% of the costs of expanding the Medicaid program to residents with incomes at or below 138 % of the FPL ($15,856 for an individual and $32,499 for a family of four). [Glied et al] These people are still not economically well off, but they may have a little more cash for necessities and perhaps the occasional digital health technology purchase. What’s really exciting from the perspective of mitigating investment risk is that this is a sustainable change; the federal government will fund 100% of Medicaid expansion through 2016, and then 90% of costs through 2020. [Glied et al] So entrepreneurs and investors entering the space can feel comfortable that this will be a systemic change with sustained market opportunity. Although this patient population may have the opportunity for some dispensible income, they are still generally economically poor, so there is still a large need for entrepreneurs to provide value through innovative B2B models. Despite the fiscal common sense expanding Medicaid, some states may choose not to adopt this reform. States that expand Medicaid stand to get a substantial influx of Medicaid dollars from the federal government while nonparticipating states still pay but don't get any of the funding back. [Glied et al] To put into perspective the magnitude of the funding, consider that by the end of this decade federal dollars toward Medicaid flowing into states will be 2.35 times the funding for building highways and 1.25 times the funding for defense procurement contracts. [Glied et al] State spending toward Medicaid will be the same regardless of whether they accept Medicaid dollars. [Glied et al] Entrepreneurs should be aware that hospitals and patients in non-participating states may present be a real challenge to early adoption given the perpetuation of limited purchasing power. Unfortunately, failure to expand Medicaid may predispose populations in those states to exacerbating digital health disparities. Medicaid expansion, along with several other provisions of the ACA [Ostrovsky], offers an opportunity for social impact through commercial growth. It will be interesting to see the impact on achievement of the triple aim and investment in this space in the years to come. I spend a lot of my time exploring the drivers of top and bottom-line growth for payers. As a physician, I had a nagging curiosity to learn about what the economics look like for my (part-time) workplace. So I explored one of the biggest changes in hospital reimbursement reform, value-based purchasing (VBP). Value-based purchasing is a reimbursement structure that is intended to reward improved clinical processes, outcomes, and patient satisfaction. In many cases, it is perceived as the inverse: a financial penalty for below average hospital performance. The following is some overly-simplified math than demonstrates how VBP works and more frighteningly, the implications of VBP for hospitals. This rudimentary analysis may serve as a useful backdrop for entrepreneurs trying to sell their software into hospitals, doctors considering how they can add value to their hospital, or patients who want to get empowered about the role of their opinion. First, let’s start with how hospitals were paid before VBP was put in place. Medicare paid hospitals per discharge based on a diagnosis-related group (DRG) specific for a disease state. More elaborate admissions like heart surgery were reimbursed more than more benign admissions like a cellulitis. With the introduction of VBP, hospitals will have their reimbursement go up or down depending on their performance in clinical processes, clinical outcomes, and patient satisfaction. The performance in each of these domains gets incorporated into a total performance score (TPS) for each hospital each year by Medicare. Depending on a hospital’s TPS compared to that of the national median TPS, a given hospital will have the reimbursement for each discharge systematically increased or decreased by some multiple (VBP Incentive Multiplier). To incentivize better performance, Medicare is reducing the baseline reimbursement for each DRG by 1% starting in 2013. That reduction will worsen to 2% by 2017. This is where the scary part begins. Let’s fast forward to 2017 when the reduction in reimbursement for each discharge is at the full 2%. Let’s also assume that a given Hospital A is performing at an annual TPS of 25 while the national average is 50. Plugging our numbers into the above formula, the VBP Incentive Multiplier = 1 + [2% x 25/50 - 2%] = 1 + [0.02 x 0.5 - 0.02] = 1 + [0.01 - 0.02] = 1 - 0.01 = 0.99. So in 2018, Hospital A will have each of its discharged diagnoses reimbursed at 99% of what the DRG reimbursement rate is for that year. If, for example, Hospital A has an operating budget of $100 mil, and if all of the revenue comes from clinical care (vs research funding), then Hospital A’s below-average performance would have just resulted in $100 mil x 0.99 = $99 mil actual operating budget, or a $1,000,000 penalty. With profit margins for highly profitable hospitals in the 2-3% range, a 1% hit on operating budget can be as much as a 50% decrease in the profit margin. The board of a hospital would not be happy with such numbers, the CEO may be out of a job, and more importantly, there may be less money to reinvest in expanding the hospital’s ability to serve vulnerable populations. Let’s take a look at a slightly less gloomy scenario. I’ll return to 2013 for this example where the DRG reduction is just at 1%. Let’s assume that in 2013, Hospital A was performing above average with a TPS of 75 while the national average was 50. Plugging our numbers into the above formula again would yield a VBP Incentive Multiplier = 1 + [1% x 75/50 - 1%] = 1 + [.01x 1.50 - .01] = 1 + [.015-.01] = 1 + .005 = 1.005. So, for 2014, Hospital A will have each of its discharges reimbursed at 1.005 times the baseline DRG reimbursement rate for that year. Assuming the same operating budget of $100 mil for Hospital A and assuming that all of its revenue comes from clinical care (vs research funding), then Hospital A’s above average performance would have turned its $100mil x 1.005 into $100,500,000 or $500,000 increase in operating budget. The resultant potential for a 25% increase in profit margin would make for a happy board, an employed CEO, and potentially reinvestment into interesting programming for needy patients. But there’s a catch! I didn’t take into account the cost of what it would take to improve a hospital’s performance. If the hospital starts and remains above the median at the same level, it will continue to enjoy higher margins. But what about hospitals that need to improve? With improvement, in theory, the goal of VBP, underperforming hospitals have a very steep uphill battle. For example, investments in improving clinical processes, outcomes, and patient satisfaction could include software, training, and evaluation costs, among others. Using EMR costs as a proxy for the range of cost for software, the cheaper EMRs cost about $4k per provider per year. If hospital A employes 100 providers, that's $400k per year, not to mention set up fees. My calculations are obviously over-simplified. But the point is that hospitals will have a difficult time achieving a positive ROI in the newly emerging reimbursement landscape. Even for hospitals that outperform the rest, their net gain from improving outcomes may be minimal at best. There are many limitations to this analysis. I didn’t include the additional burden for hospitals due to the impact of efficiency metric that is due to roll out in 2015 and 30-day readmission penalties, among others. Although well intended, VBP has many unforeseen consequences that may disproportionally and negatively impact hospitals that serve disadvantaged patients. These unforeseen consequences and my rudimentary math exercise above are examples of why hospitals and the healthcare system as a whole may need to focus (even faster) on what happens before and after the admission. There is an emerging transition from fee-for-service to capitated and episode based reimbursement models. With the fastest growing cost driver in healthcare being post-acute care, there is a lot of attention being paid to how to mitigate the increasing spending. One approach to curb the growing cost of post-acute care is to improve interoperability among provider organizations. A large financial driver to support interoperability is the need for hospitals to meet the requirement for meaningful use (MU). Among those requirements is the need for hospitals to communicate with post-acute providers. The main mechanism for interoperability between the myriad provider organizations is the health information exchange (HIE). HIEs allow for providers to communicate by creating a common roadway for data to travel. There are emerging national standards for the layout of those roadways, their on-ramps and off-ramps, the types of vehicles that drive on them, and the type of cargo those vehicles can carry. The focus of these evolving standards, appropriately, is on the provider organizations. Yet there remains much difficulty for providers to communicate with each other. And it is especially difficult for startups to break into that dialogue. Without access to communicate health information with providers, it is challenging for startups to test their interventions for value. Adding to the difficulty of accessing providers and payers is the frothiness of the digital health startup community. Many fledgling entrepreneurs spend too little time performing the necessary review of analogs and antilogs to explore whether there are others trying to solve the same problem in the same way. Even when there is some differentiating factor between startups, the incremental difference between startups is drowned out by too little attention span and too high expectations for performance by payers. For example, many startups in the post-acute care sound something like: “care coordination platform to drive down admissions.” Startups need a way for payers to better hear the type of care coordination platform, by whom it is used, and how they drive down admissions. What if instead of aiming to be interoperable with providers, startups focused on being interoperable with each other? Since HIEs have already created standards for the way data is transmitted and in what form, startups can leap frog the EMR community and revolutionize the use and value derived from HIE and interoperability standards. Interoperability among startups would create a widget ecosystem where each startup had a small but unique value proposition that was built on a common, best-practice care coordination scaffold. The standardized data architecture would make it much easier for provider and payer organizations to tap into the fabric of collaborating startups. The value of that fabric would grow with each new startup that wove in its data. And the new insights derived from the transformation of multiple strings of data into one robust quilt would reinforce the unique value of each startup contributing to the startup HIE. The process for creating a startup HIE would include utilizing standards for the way data is input and output. There would need to be agreement on the mechanism of transmitting the data, whether it was through a local HIE or directly between startups. The value of the synergistic relationship would then have to be tested and conveyed to the customer in the form of offering more robust data and analytics or helping to better meet some sort of reporting requirements. Finally, the collaborating startups should establish and share best practices with their community of collaborators in order to eliminate waste in the network and increase the network value for all participants. The interoperability between startups would allow each one to focus on differentiating themselves by focusing on addressing direct customer needs and reinforcing their verticals through focused product development rather than struggling on common horizontal problems like finding out how to communicate with their customers. Perhaps there is a role for startup Incubators to be the leaders, facilitators and moderators of these types of collaborations. What if there was a digital health startup incubator HIE?! The incubator that hosted a startup HIE would draw pre-qualified startup applicants, attract investors seeking curated investments, and provider organizations seeking connected startups. One limitation of this approach is the perceived risk of sharing data with competitors. This risk can be mitigated by a strong incubator community that sets strict ethical rules and the option for startups to be able to remove themselves from the Startup HIE. I look forward to seeing if startups that collaborate have a higher likelihood of delivering better value to their customers and if they experience more growth then non-collaborating companies. We are at the beginning of a historic era for innovation in health care delivery in the US due to the convergence of payment reform and the proliferation of mobile technology. Academic medical centers (AMCs) have the potential to be leaders in this era of delivery reform, but most have yet to display a commitment to delivery innovation on par with their commitment to basic research. [Ackerly et al] This discrepancy is not due to lack of talent or innovative spirit in AMCs, but rather because of a paucity of training in designing and implementing end-user validated interventions and a lack of established pathways for career advancement in clinical innovation outside of research, among other barriers. A group of medical residents in the Boston Combined Residency Program (BCRP) have come together to explore how changes in the medical training experience can help cultivate leaders in efficient, patient-centered, and commercially sustainable healthcare delivery innovation. Below is a draft overview of the themes and structure of an Innovation Academy for a medical residency training program. What is an Innovation Academy? The innovation academy is a career development, networking, and idea incubation program for creating healthcare delivery innovations by trainees in medical residencies. The innovation academy is needed in order to equip future healthcare leaders with skills necessary to usher AMCs and health systems more broadly through the immense change that is happening because of health care reform. The missions of most AMCs include thought leadership, creation of generalizable knowledge, training future leaders in healthcare, and providing care to patients. Until recently, the business models of AMCs supported these missions with volume-driven reimbursement for patient care and NIH-funded research as the largest revenue generators for AMCs. With shrinking NIH budgets and hospitals facing 10-15% decreases in reimbursement over the next several years, the traditional missions of AMCs may no longer be aligned with their current business models. Furthermore, the skills being taught to trainees today, namely clinical and research skills, are only a fraction of the skills that will be requisite for clinicians to thrive or even survive in the delivery systems of the future. The innovation academy can help equip residents with the skills and network that will enable them to effectively contribute to achievement of the Triple Aim and to find or create jobs as clinician-innovators when they complete their training. To be aligned with the spirit of innovation, the Innovation Academy should adhere to a core principle of design thinking which is creating an experience with the end user in mind. In that vein, prescribing a fixed set of “pillars” can limit the necessary out-of-the-box thinking that may be needed for residents to learn how to create truly innovative system redesigns. So the pillars should be used as a guide rather a fixed construct. The pillars include technology, policy, entrepreneurship, system redesign, and quality improvement. Each of these realms can overlap with one another. But each pillar also encompasses sufficient unique skill sets and career paths that warrant their own designation. Although the incentive structure of the innovation academy should be based on value-adding deliverables, scholarly activity is still important for dissemination of knowledge as well as reinforcing and solidifying lessons learned through writing. To enable maximum flexibility and still encourage writing, the innovation academy should require all participating residents to submit at least 2 blog posts per year. The blog would enable an informal peer-review process without the time-consuming obligations of writing, submission, and revision for a formal peer-reviewed publication. In addition to learning by doing, the innovation academy would provide expert speakers and mentors to provide structured bursts of wisdom through noon time talks and afternoon skills sessions. We propose including 1 residency-wide lunch time talk by experts each quarter. In addition to group didactic learning opportunities, we strongly support the role of mentors in identifying individual goals. 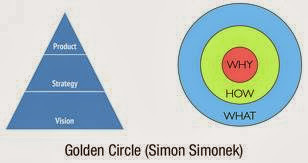 Coaches can assist with achievement of personal life goals, “here and now” career goals, and longer term career arc goals. Residents will outgrow mentors over time, so having a robust mentorship program is essential. Mentors should be internal and external to the home institution. Mentors should also be internal and external to the healthcare industry altogether. Furthermore, mentors can and should be peers as well as faculty-level. The goal of using faculty-level mentors is to help the resident answer the questions that they now they don’t know. The goal of peer-mentors is to help think through what they don’t know that they don’t know. The orientation to the innovation academy should occur during the first few weeks of residency. The goal of the orientation is to expose residents to the need for and purpose of the innovation academy, sample careers, and key concepts/skills. Examples of career paths and examples of how to find a job “doing innovation” include Dr. Clay Ackerly (Assistant Director of Population Health at Partners Health Care, Dr. Daniel Stein (Director Medical and Clinical Services of Walmart), Dr. Patrick Conway (Director of Centers for Medicare and Medicaid Innovation - CMMI), Dr. Joshua Sharfstein (Former Deputy Director of FDA, Current Health Director of Maryland), Dr. Rushika Fernandapulle (Founder, CEO Iora Health), Dr. Wen Dombrowski (Chief Medical Information Officer VNA Health Group). The goal of the innovation academy for interns is introduce them to projects and people that represent various approaches to achieving their vision for impacting health. Another goal is to help them find mentors. Additionally, the innovation academy can help interns start exploring interesting projects through their Keystone experience. The goal of the innovation academy for juniors is to identify the approach the resident will take to achieve the vision they clarified during intern year. With strong mentor guidance, residents should be able to leverage the internal and external network of the innovation academy to identify a project to work on as a senior during the 3 month academic development block (ADB). 1-2 months of “research” elective can be used as a dry run working with a team that may be the home of the innovation project during senior year. The goal of the innovation academy for seniors is to provide the mentorship and incubation of project ideas during their ADB. By the end of senior year, residents should have a deliverable completed. Part of creating the deliverable should be creating the connections and demonstration of capacity to create or find a job in clinical innovation. The goal of the innovation academy for recent graduates is to serve as a job pipeline for clinicians with hard skills and experience in the various pillars of innovation. The job-pipeline would be aligned with formal or informal pathways to organizations that are leading health delivery innovation and redesign including CMMI, Insitute for Healthcare Improvement (IHI), Management and Policy Fellowship at MGH, Kauffman Fellowship in entrepreneurship, Clinician-in-residence at a startup incubator such as Startup Health, among others. Executing an innovation academy requires leadership at three levels. First, senior program leadership has to fully support the vision, mission, and culture of the innovation academy. Second, resident leaders need to own the innovation academy, it’s goals, and it’s activities, supported by faculty mentors. And third, resident leaders including current and future chief residents should be involved to preserve institutional memory and serve as a bridge and/or buffer between residents and faculty. Many interesting avenues of future work are possible around the innovation academy and innovation in medical training. One particularly interesting project would be to create a “Myer’s Briggs” personality test to predict the type of clinical innovation career that best reflects the resident’s strengths and interests. This could be done by retrospectively looking at successful clinician innovators and project to when they were interns. Furthermore, the efficacy of such a program will need to be evaluated. But before studying this approach, we will first prototype! For more information and public discussion of this topic, please come to the panel on "Hacking Medical Training" at SXSW in March 2014. -What do you want to get out of this experience? -What do you know about value-based care? Assuming they are not opposed to learning about skills that will allow them to excel in their careers a clinician leaders (not necessarily start companies or work in the private sector), then proceed to Step 2. With the rapidly evolving health care system, the current "how" and “what” or career path may not help medical trainees achieve the full potential of their impact. To preface this section, it’s important to note that the following content and exercises may help you in the long term in your career, but in the short term may also help residents identify projects for Academic Development in residency or Fellowship Projects. 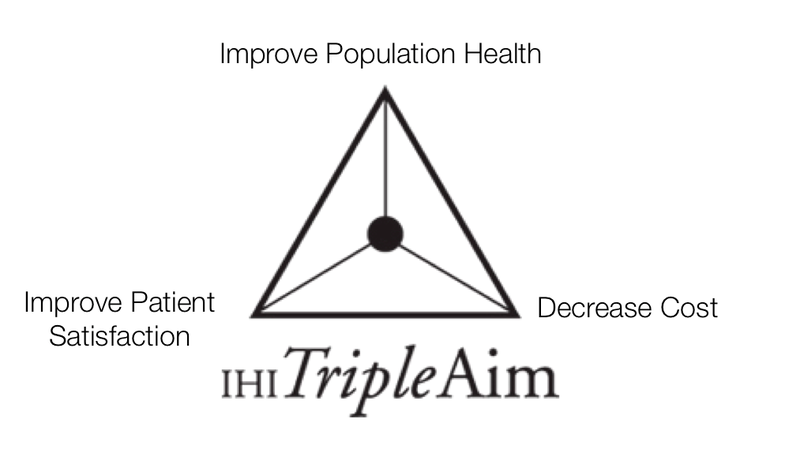 In order to achieve the triple aim, residents should be familiar with a combination of improvement science and innovation methods. Other approaches to delivery innovation facilitate not just practice improvement, but rather the creation of entrepreneurial, potentially high-risk new products or processes driven by consumer adoption. Lean Startup Thinking is a management process that aims to create a minimal viable product (MVP), which is an intervention with the fewest features needed to get an end-user to pay with a scarce resource such as money, time, or attention. [Reis] Similar to the Plan-Do-Study-Act cycle of Quality Improvement [Langley], the Build-Measure-Learn cycle of LST is a continuous process of building a prototype, testing and measuring the impact of the intervention, and learning from the results of testing to inform the refinement of the prototype. [Figure 3] This cycle is rapidly repeated until there is sufficient validation of an MVP or until there is sufficient invalidation to change course or pivot toward another MVP. Although traditional implementation science and LST share the same origins of Lean Management, Six Sigma, and the scientific method, the outcome being tested in LST is not a statistically significant difference between two interventions or an improvement in clinical outcomes. Rather, LST focuses on the confirmation that a patient, provider, or payer is willing to pay for a new product or service. [Reis] The benefit of using LST as the foundational methodology for incubation at AMCs is its emphasis on end-user validation, which creates consumer-driven rather than clinically driven incentives to prioritize patient-centeredness, minimize costs, and optimize clinical outcomes. The alignment of these incentives and the inherent for-profit orientation of LST works towards generating sustainability through generating revenue. In contrast, traditional implementation science approaches may produce or discover interventions that lead to improved clinical outcomes, but if end-users do not perceive value in those outcomes, then the interventions risk never being utilized or the cost of those interventions may go unchecked. The end goal of LST is the creation of a product or service that builds on the three pillars of quality improvement [Berwick] to achieve the “quadruple” aim: improve patient satisfaction, decrease costs, improve care quality, and be commercially self-sustainability. Berwick D, Nolan TW, & Whittington J. 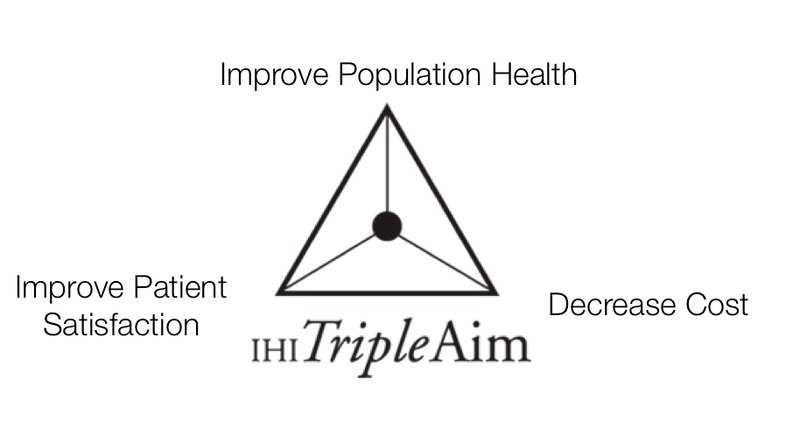 The Triple Aim: Care, Health, and Cost. Health Affairs. May 2008: 27(3). 759-769. Porter ME. What Is Value in Health Care? N Engl J Med 2010; 363:2477-2481. Langley et al. “The Improvement Guide: A practical approach to enhancing organizational performance.” Jossey-Bass Publishers. 2009. Kelly T. The Art of Innovation: Lessons in Creativity from IDEO, America's Leading Design Firm. Random House. 2007. Now apply the “why matters more than what” to a career as a clinician innovator. Digital health startups secured $1.4 billion in investment in 2012 with healthcare administration, personal-health, and consumer-engagement emerging as some of the leading investment categories. Despite the growing interest in healthcare, early-stage investors’ reluctance to invest in unfamiliar industries has limited funding for more nascent digital health opportunities like managed long-term supports and services (MLTSS). Managed long-term supports and services entail risk-bearing organizations, like health insurers, coordinating care for frail elderly that are vulnerable to experiencing health disparities. The goal of MLTSS is to triage the patient to the lowest cost care and maintain sufficient functional supports to keep the patient in the community rather than in the institutional setting. Between the evolving healthcare regulatory environment, clinically complex patients, and dispersed post-acute care market, the multifactorial nature of MLTSS makes for an insurmountably steep investor learning curve. The deficit in the average investor’s knowledge base about MLTSS not only precludes investment consideration, but more importantly stymies the funding channels needed to fuel innovation for vulnerable populations. Furthermore, the digital health technologies currently garnering the most investment do not emphasize the elimination of health disparities for vulnerable populations; in fact some may be at risk of exacerbating disparities. Filling the gap in investor understanding about the market opportunity and emerging business models for digital health startups in MLTSS could help more investors realize the potential for compelling ROI in these companies and simultaneously achieve the Triple Aim for vulnerable populations. Source: IHI Innovation Series. Cambridge, MA. 2012. The market opportunity for MLTSS is grounded in the substantial potential for payers to profit from managing complex patients. Typical margins for payers managing generally healthy patients reimbursed by Medicaid range between 2-5%. Higher-risk patients, particularly those that are Medicare-Medicaid Dually Eligible (Duals), can lead to margins as high as 10-15%, if managed effectively. Conversely, some Duals can cost $60,000 per year. And when payers fail to risk stratify appropriately and only negotiate a capitated $2,500 per member per month (PMPM) premium ($25,000 per year), they can very quickly lose a lot of money. The profit potential from managing Duals arises from their disproportionately high utilization of acute care hospitals, with almost twice the hospitalization rate for Duals than general Medicare non-Dual patients. Duals are also more likely than non-dual Medicare patients to get readmitted, with 25% of Duals and 20% of Medicare non-Duals being readmitted within 30-days of discharge. In addition to being higher utilizers, Duals also account for a disproportionate share of Medicare and Medicaid spending: Duals comprise 20% of the population and 31% of spending for Medicare and 15% of the population and 40% of the spending for Medicaid. 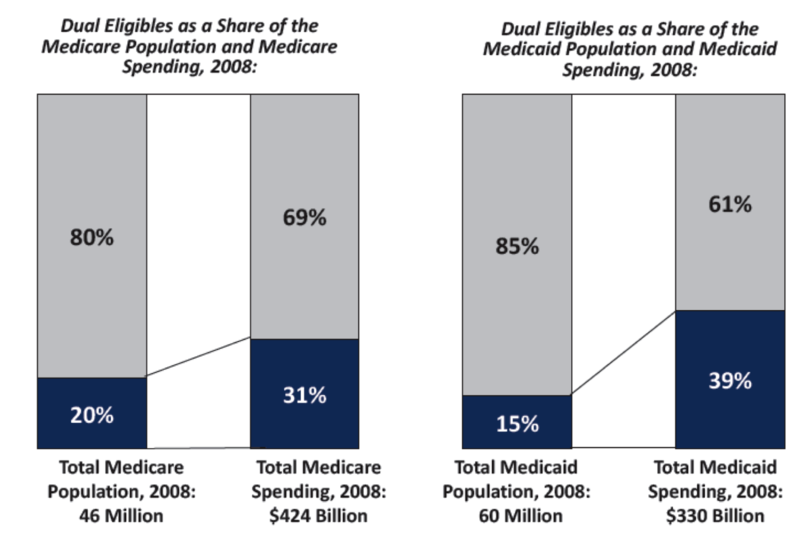 Source: Jacobson G, Neuman T, & Damico A. Medicare’s Role for Dual Eligible Beneficiaries. APRIL 2012. Kaiser Foundation. While 19% of the average PMPM premium for Duals is spent on hospitalization costs, Duals are also high utilizers of post-acute care services with 23% of the PMPM premium being spent on Home Care and 33% on Skilled Nursing Facilities (SNFs). Even though acute care is one of the largest contributors to Duals spending, post-acute care is the fastest growing cost. Within post-acute care, institutional long-term care, such as SNF care, is $1614 more expensive PMPM than home and community based services. Not only does MLTSS decrease cost of care, a review of 9 randomized controlled trials showed that integrated and coordinated care improves outcomes and reduces health care utilization for frail elderly people. This creates an enormous cost differential for payers to take advantage of, particularly when up to 30% of “low care” SNF patients could age in their homes instead of the SNF if they had the right resources or technology in place. With the MLTSS market doubling since 2004 , digital health has enormous potential to reduce hospitalizations and unnecessary utilization of expensive post-acute care by streamlining, augmenting, and scaling MLTSS. In addition to outlining the market opportunity for digital health in MLTSS, preparing investors for more complex business models may help them become more comfortable investing in this space. A major challenge to creating scalable business models for MLTSS digital health companies is the limited purchasing power of the end beneficiary, the patient. These patients are typically financially compromised in addition to being clinically high-risk. The confluence of socioeconomic and medical risk factors limit the ability of Duals and other vulnerable populations to purchase digital health technology directly. Additionally, their technological illiteracy due to language or age barriers introduces more challenges to freemium or ad-based models. A promising business model for MLTSS digital health startups is selling directly into risk-bearing organizations that have the most to gain from optimizing care coordination and care management for Duals. Several policy instruments have created incentives for such organizations to keep patients healthy and in their homes. These organizations, typically payers, have substantial purchasing power and can drive scale of a technology once it is adopted. A major limitation with a B2B sales strategy with payers is the long sales cycle. But the latter is a surmountable barrier, especially when investment dollars provide a startup in this space with the runway to test their product and business model a sufficient number of times to find the approach that is scalable. By educating investors about the opportunities that lie in the MLTSS digital health space, we hope to facilitate more informed investment into a healthcare space that is pregnant with opportunity to create profit for investors and achieve the Triple Aim for vulnerable populations. Other stakeholders in the startup ecosystem can help to eliminate risk for investors in MLTSS and other spaces that leverage digital health to eliminate health disparities. Incubators can vet startups for top entrepreneurs and provide a conduit for startups to difficult to reach resources such as development talent or legal guidance. Foundations can help to further educate investors and establish best practices for investment in digital health to serve vulnerable populations. The government can continue to liberate data and push for rational interoperability standards. This glimpse into socially-minded digital health innovation and investment is just one of many opportunities to leverage commercial growth to eliminate health disparities. 2) Feeney et al. Private investors' investment criteria: Insights from qualitative data. Venture Capital: An International Journal of Entrepreneurial Finance. 1999, Vol 1(2). 121-5. 6) Berwick D, et al. Health Aff May 2008 vol. 27 no. 3759-769. 7) Young K, et al. 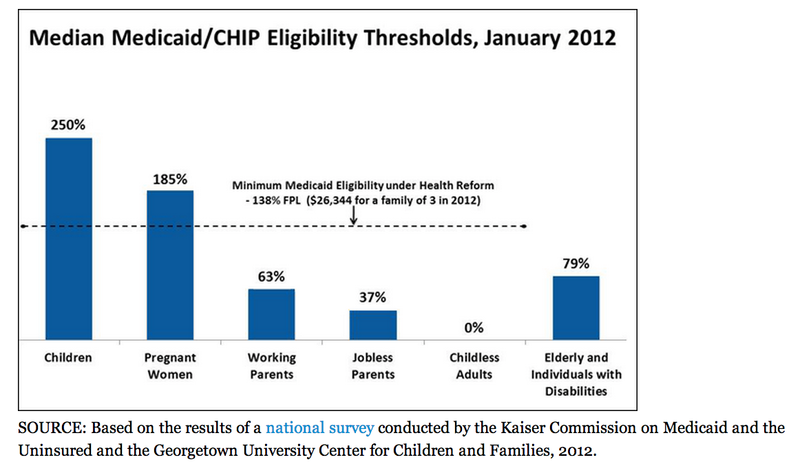 Medicaid and the Uninsured: Medicaid’s Role for Dual Eligible Beneficiaries. April 2012. Kaiser Foundation. 8) Segal M. CMS Policy Brief: Dual Eligible Beneficiaries and Potentially Avoidable Hospitalizations. 2011. 9) Jencks SF, et al. NEJM 2009; 360 (14):1418‐1428. 10) CMS. A Data Book: Health Care Spending and the Medicare Program. 2012. 11)Chandra et al. Large Increases In Spending On Postacute Care. Health Aff. 2013 May; 32(5): 864–872. 13) Eklund K, Wilhelmson K. Outcomes of coordinated and integrated interventions targeting frail elderly people. Health Soc Care Community. 2009 Sep;17(5):447-58. 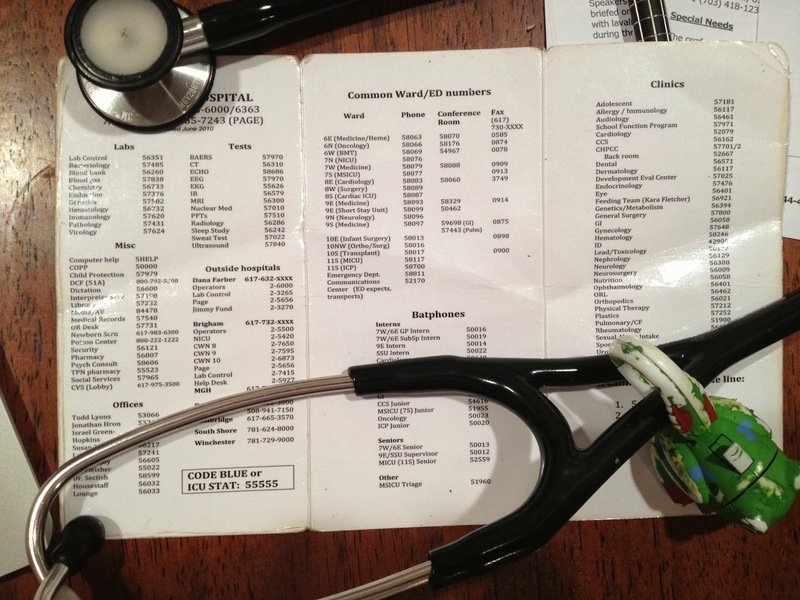 As a physician, I carry around cheat sheets to condense critical information into an easily accessible stack of pocket-sized, laminated tri-folds. They include important numbers to call, medications to use in a code-blue situation, and antibiograms to help select the right drug for the right bug. This is all information I know how to use but may not be able to regurgitate off the top of my head, especially in life or death situations. As an entrepreneur, there are no such cheat sheets. There’s no pamphlet or app that condenses the essentials of Customer Development by Cooper and Vlaskovitz, Lean Startup by Reis, Innovation Accounting by Maurya, Design Thinking by McCarthy and Berkowitz, and Pirate Metrics by McClure. Although a startup may not be as tenuous as a critical airway, easily accessible information on startup techniques can help an entrepreneur focus on the process rather than on the technicalities of entrepreneurship. I heavily borrowed from the above mentioned thought leaders in entrepreneurship to create the following cheat sheet. 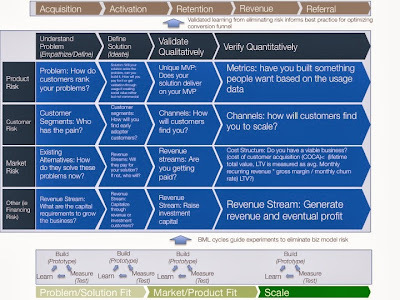 The x-axis of this cheat sheet is oriented to the stages of customer development. On the left is the beginning of the value discovery process: problem/solution fit. On the right is scale, every entrepreneur's goal. Of note, I switched the wording order of product/market fit to market/product fit to show an evolution from problem to market and solution to product. 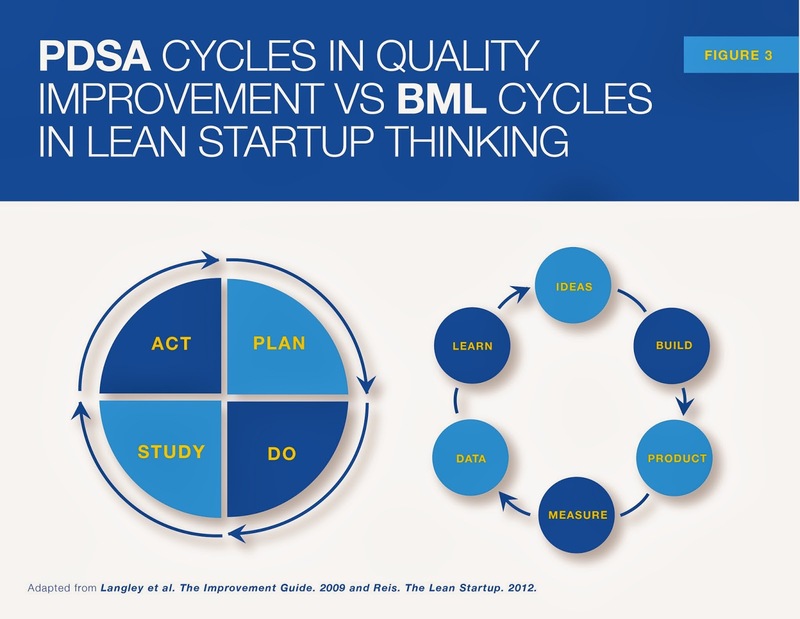 Just above the axis are a series of build-measure-learn cycles from Lean Startup. The build-measure-learn cycles are only valuable in the context of the type of risk they are designed to test and eliminate, which is shown above the build-measure-learn cycles in the risk-matrix. Based on Maurya’s "Running Lean" and "Innovation Accounting" literature, the three major risks to the business model (product, market, customer) are outlined with their respective “critical questions.” The questions along each type of business model risk are organized based on a progressive sequence of steps including understanding the problem, defining the solution, and qualitatively and quantitatively validating the elements of the business model. Due to space limitations, I did not incorporate the lean canvas, which itself is a very powerful tool. 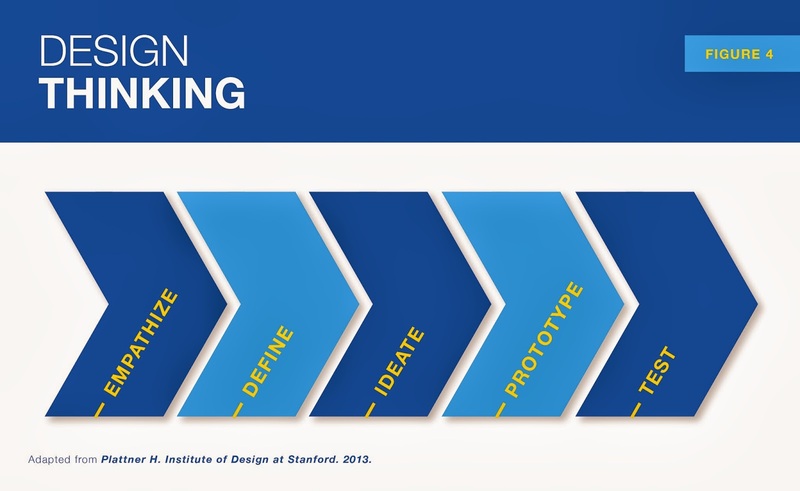 These elements of innovation accounting have corollaries to elements of design thinking such as "empathize", "ideate", etc (italicized above). As build-measure-learn cycles are completed, the questions about business model risk in the innovation accounting matrix increasingly become answered. The learning from these experiments helps to inform best practices for optimizing the conversion funnel shown at the top of the image. An important note about this presentation of the conversion funnel is that in enterprise level sales in healthcare, I have found that the “retention” and “revenue” sections appear transposed. When selling into payers or providers, the customer is often retained first for a pilot then they pay some time later. And referrals only come later in the sales cycle. As startup teams go through build-measure-learn loops to conduct experiments that eliminate risk to the business model and inform the conversion funnel, they will hopefully efficiently move toward the right side of the x-axis. 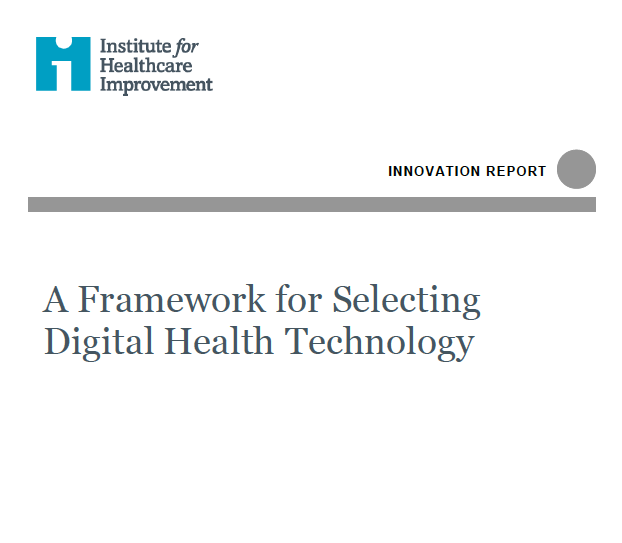 Moving beyond cheat sheets, startup entrepreneurs would greatly benefit from a set of validated, peer-reviewed best practices in digital health innovation to guide them to creating the next disruptive technology. Failing fast, failing cheap, and failing often is a good thing. It leads to efficient discovery of value and eventual creation of products and services that are scalable. Healthy byproducts of that process are “failed” or invalidated ideas. Many ideas are interesting but have no real potential to scale. Some ideas may not be scalable in the current time or current marketplace or via the current business model or with the current target consumer. But perhaps they could be scalable or value generating in a different context. After two years of bootstrapping a startup, I’ve seen colleagues come and go with great ideas gaining exciting momentum then extinguishing just as quickly as they became hot. Some failed startups only made it to the idea phase. Others built appreciable technology. Most startups achieved valuable invalidation. All of these ideas and code and learning usually goes to waste because there is no repository for them to be stored. And shortly after the spark of one startup goes out, several new ones pop-up, many times striving for the same magic that their predecessors failed to create. Mistakes are remade. The square wheel is reinvented. What if the startup community had a mechanism to preserve the institutional memory of the successes and more importantly failures of preceding startup attempts? Instead of the current virtual startup graveyard that lives in the recesses of the Way Back Machine (web.archive.org), I propose creating a central repository of composted startups to serve as the fertilizer for future innovation. Beyond just providing the micronutrients of ideas to inform revisioning of prior startup concepts, such a repository could recycle programming architecture, business models, and networks to rapidly relaunch old ideas in new ways. 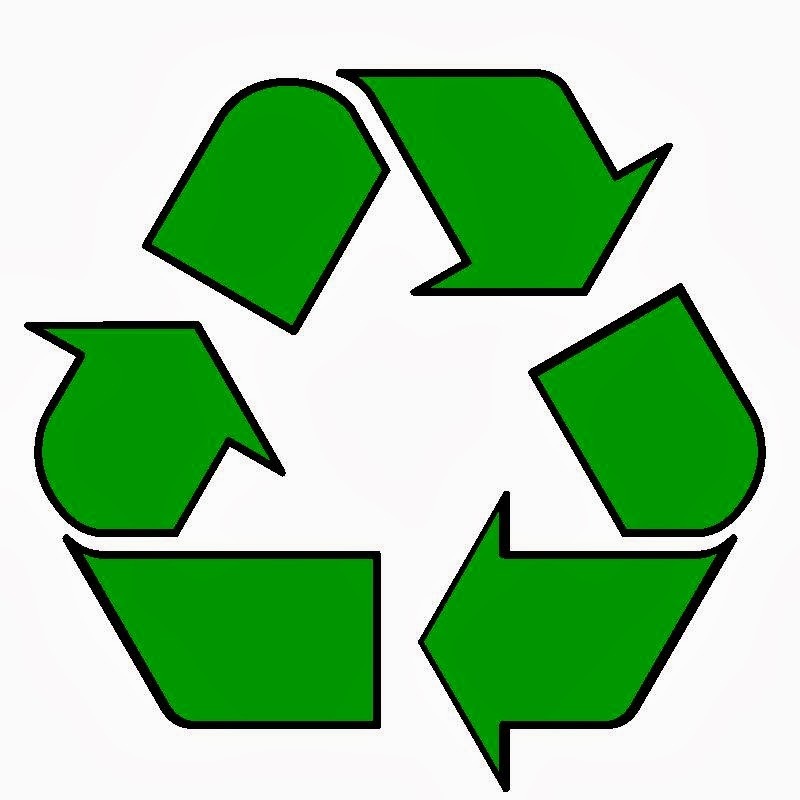 Such startup recycling plants have real potential for self-sustainability by commercializing repackaged startups and reselling them to other startups, corporations, or M&A firms. The startup recycling plants could also take the approach of re-purposing technology for sectors with completely different business models and value drivers such as academia, non-profit, or global health. What if the startup ideas that barely missed the mark with achieving enough traction to scale in a the private sector space could be recast in the public space to create just as much value but with a different sustainability strategy? Such startup recycling plants would have to be carefully curated. Startup incubators and accelerators, such as www.startuphealth.com, could serve a logical home for these places of rebirth. Also, large corporations with investments in open innovation have the potential to perform the function of startup purgatory. And then there are the non-profit spaces for innovation such as GHDonline.org that could add value to this process. The current lifecycle of most startups is an open circuit that dissipates the spark of innovation. 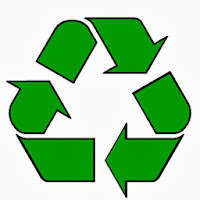 Closing the loop of the startup lifecycle with a startup recycling plant has the potential to breathe new life into old ideas, transform a patchwork of hackers into a productive professional workforce of entrepreneurs, mitigate some of the downside risk for investors, and eliminate enormous waste from the innovation process. We are at the beginning of a historic era for innovation in health care delivery in the US due to the convergence of payment reform, proliferation of mobile technology, and changing provider culture toward value rather than volume-based care. Academic medical centers (AMCs) have the potential to be leaders in this era of delivery reform, but most have yet to display a commitment to delivery innovation on par with their commitment to basic research. This discrepancy is not due to lack of talent or innovative spirit in AMCs, but rather because of a paucity of training in designing and implementing end-user validated interventions and a lack of established pathways for career advancement in clinical innovation outside of research, among other barriers. Please join us in the exploration how AMCs can become leaders in efficient, patient-centered, and commercially sustainable innovation by committing to disruptive changes in training the next generation of clinician-innovators. The healthcare financing environment is rapidly changing. 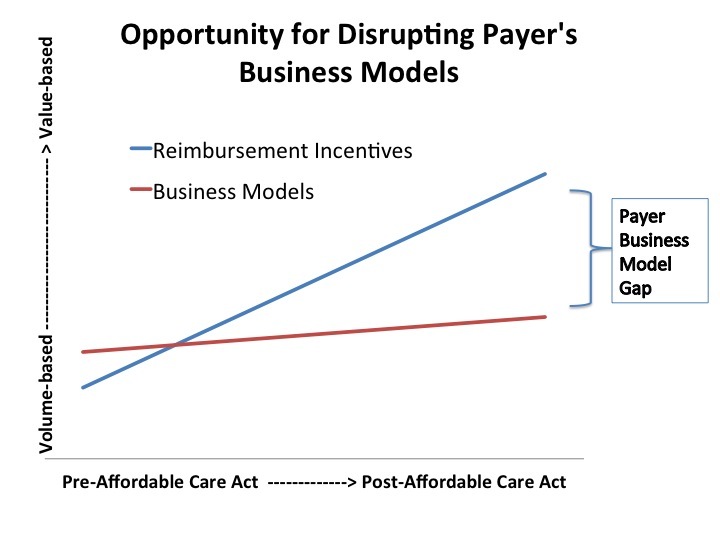 The Affordable Care Act (ACA) has created a rich substrate for innovation. Although healthcare reform holds tremendous promise for patients and the entrepreneurial community, leveraging the quickly evolving opportunities can be very challenging for slow moving organizations such as payers or health delivery systems. 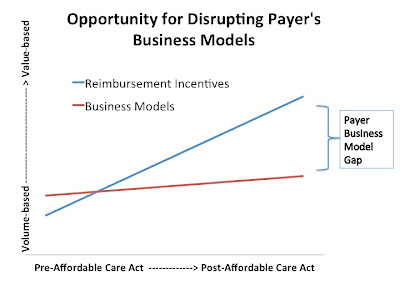 In fact, there is a rapidly emerging gap between reimbursement incentives that are being created by the ACA and the existing business models of payers and health systems (Figure 1). Nimble startups have an unprecedented opportunity to fill those gaps to achieve entrepreneurial success and create value for patients. The ACA unleashed billions of dollars to spur innovation. Many of the ACA’s provisions transform healthcare reimbursement from volume-based to value-based. Examples of such programs include the Comprehensive Primary Care Initiative, the Duals Demonstration projects, Community-based Care Transitions Projects, Pioneer ACOs, and bundled payment projects, among several others. Each of these programs directly and/or indirectly redefine incentives for healthcare. And to ensure sustainability, the ACA has provisions to grant HHS the authority to scale these interventions without Congressional approval. That, in theory, means evidence-based and not politics-based systematic reimbursement of innovations by Medicare/Medicaid that drive down costs and improve outcomes. 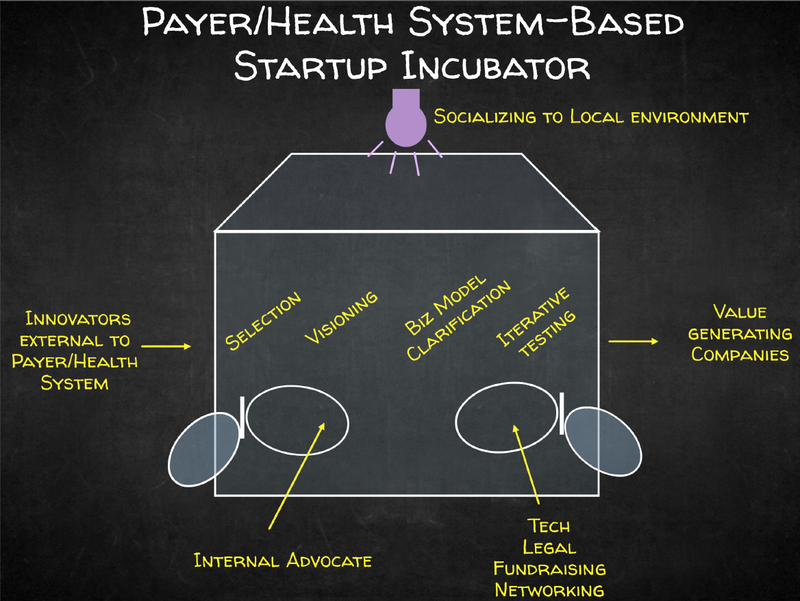 Although payers and health systems have enormous resources to bare to respond to these stimuli, they are generally slow to move, which opens the door for startups to rapidly discover value, validate that value, and collaborate with payers and health systems to scale that value. 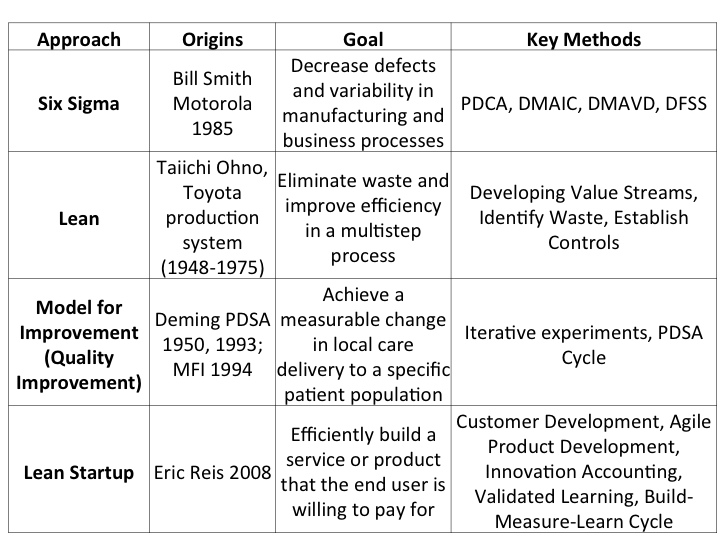 The challenge for startups in reaching their potential to provide value to payers and health systems is getting started with iterative testing of their value proposition. Getting “in the door” with payers and health systems is incredibly challenging. 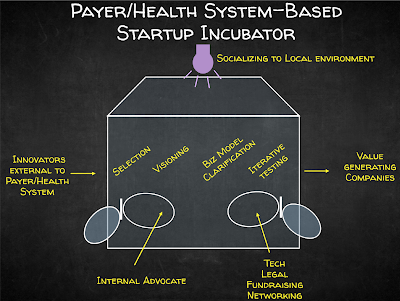 One possible solution to bridging the gap between the startup's value proposition and the payer or health system’s feedback on that value proposition is creating an incubator function internal to these organizations (Figure 2). Establishing a process for vetting external ideas internally (or cultivating internaly innovation through “intrapraneurs”) can help to narrow the gap between problem and solution. The key to creating such a pathway is establishing a precedent. The real innovation has to happen at the payer and health system level with leadership that is forward-thinking/innovative/crazy enough to allow billion-dollar organizations to engage startups. Once the early-adopting corporations take the plunge, then a precedent will need to be set by the first guinea-pig startups to go through the process of incubation or cultivation. And finally, best practices will need to be created and applied through a dynamic process that creates a pipeline of innovation into these large institutions. And at that point, and only that point, will the Payer Business Model Gap start to narrow. The Affordable Care Act has created a powerful incentive for health systems to test the value of transitioning from volume to value based reimbursement. Accountable Care Organization (ACO) pilot programs are at the forefront of this multibillion-dollar experiment. An ACO is a coordinated system of healthcare providers and services that are incentivized through reimbursement to improve the quality and reduce the total cost of care for a designated patient population. A major unknown variable in the ACO model is the optimal interaction between ACOs and academic medical centers (AMCs). Depending on the ultimate relationship between ACOs and AMCs, there may be varying degrees of opportunity for digital health startups to add value. Academic medical centers can either go the route of developing strong relationships with ACOs or operating independent of them in the current paradigm of fee-for-service (FFS) care delivery. And the two potential outcomes of ACOs after the demonstration projects run their course are ACOs either becoming the standard care delivery system or becoming extinct. 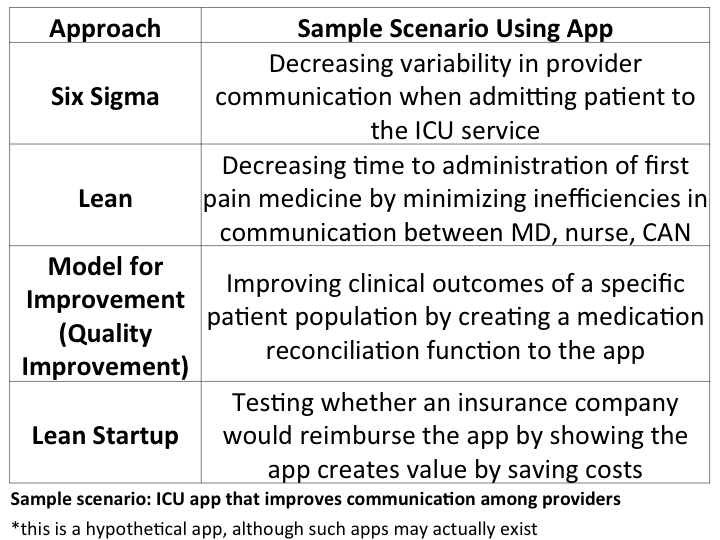 Below are the implications to digital health startups of these hypothetical scenarios depending on the viability of ACOs and the interaction between ACOs and AMCs. A major distinguishing feature of AMCs is their specialized inpatient services, which make them suitable as tertiary and quaternary referral sites for less specialized hospitals and ambulatory centers. Specialized or inpatient services may include surgical interventions, intensive care, radiology services, management of multiple comorbidities, and rare disease management, among others. ACOs require access to specialized healthcare services in order to manage complex or intensive medical needs for its patients. ACOs and AMCs can interact in one of two ways (Figure 1): 1) AMCs can create their own ACO and build outpatient, less specialized services to complement their specialized inpatient services. I will refer to this as the Build Your Own ACO Model (BYOA). 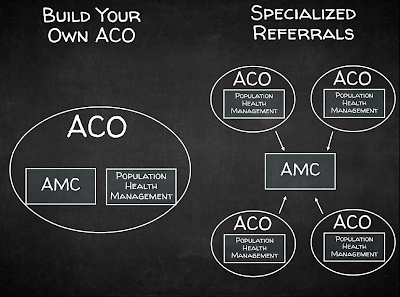 2) AMCs can serve as referral sites for ACOs that are primarily comprised of outpatient providers. I’ll refer to this as the Specialized Referrals Model (SR). If ACOs prove to decrease cost and improve the quality of care, they may become the standard care delivery model and the following scenarios could arise depending on the interaction between AMCs and ACOs. AMCs that choose to never engage with ACOs and continue being reimbursed by the traditional FFS model would loose out on a major influx of referrals. Currently, many AMCs are forming partnerships with outpatient ACOs or providers that may eventually coalesce into an ACO. These partnerships are intended to drive referrals to the AMC. If ACOs become the norm, then the AMCs that bet on the ACO model not working would have missed the opportunity to build the foundation for referral relationships and may end up being crowded out by competitors that did invest in networking with ACOs. The unaffiliated AMCs would subsequently have a very difficult time getting new referrals for tertiary care. If ACOs become the standard and AMCs do engage with ACOs at an early stage, then the outcomes for the AMC would depend on the type of interaction they developed with the ACO. 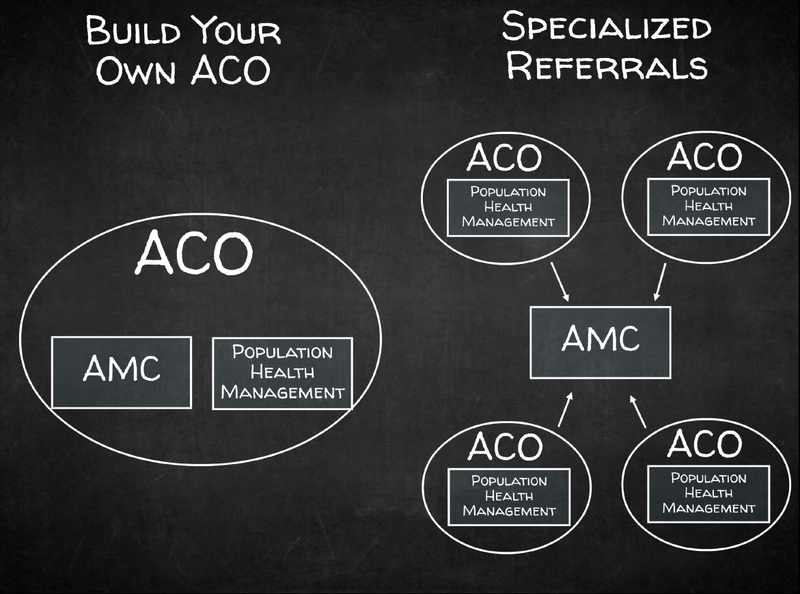 In the SR model, the AMC would have a strong referral network from the ACO. The financial incentives would be mutually aligned: The AMC would still be reimbursed through a FFS model with likely bundled payments; their incentive to provide high quality care would be to continue getting referrals from the ACOs; and the ACO would be incentivized to refer to the AMC with the best specialized care to optimize management for their complex or acutely ill patients so that more patients would choose to participate in that ACO. In the BYOA model, the AMC would build its own ACO capacity resulting in competing and counterproductive incentives. On the one hand, the overall ACO mission would be to keep patients out of the hospital in order to decrease costs. On the other hand, the AMC within the ACO would be incentivized to increase patient volume to demonstrate the need for its services. The ACO as a whole would need the tertiary services of the AMC, but the AMC would be a cost center and patients would have the choice to go to other AMCs, which is a separate and complex challenge. If ACOs fail to decrease the cost and improve the quality of care, they will become extinct and our health system will likely revert to the existing FFS system. AMCs that chose to never engage with ACOs would be well positioned to continue their current business model without the wasted opportunity costs of interacting with ACOs. Although they may lose the opportunity to increase their network of referring outpatient providers, they would have maintained the efficiency of their existing ambulatory and general services. If ACOs fall out of fashion, then the outcomes for AMCs would be very different depending on the type of interactions that were established with ACOs. In the SR model, the AMC would have maintained and streamlined its core competency of specialized services. Although the AMC may have to bear the cost of reestablishing its general practice and ambulatory services, it would likely maintain the upside of building a large referral network for tertiary care. In the BYOA model, AMCs would suffer much greater losses than in the SR model. By building out a population health management infrastructure, the AMC would have created an expensive and largely useless shell for care management. With reversion to a FFS model, there would no longer be a financial incentive for comprehensive population health management and billing would once again be directly managed through CMS rather than the ACO. On the whole, the best business model for AMCs to adopt is refining their tertiary and quaternary capabilities, slimming down on general ambulatory services that can be provided by outpatient delivery systems, and growing their referral networks from ACOs. This would expose the AMC to the upside of sustainability if ACOs remain in vogue and minimizes their downside risk if ACOs go out of fashion because they retain their core competency of specialized services. There are major implications of the future of ACOs and their interaction with AMCs on opportunities for reimbursement for digital health companies. If ACOs prove to be valuable and become widely adopted, then there will be more incentive for interventions that 1) improve population health management, 2) keep patients at home and out of the hospital, and 3) facilitate care coordination. If ACOs fail to be adopted universally, then the reimbursement environment will suffocate startups focusing on value-based care. However, startups that aim to 1) augment workflow management, 2) increase hospital efficiency, and 3) improve aspects of surgery or procedures will potentially benefit from the failure of ACOs. In both scenarios, startups that aim to 1) improve patient satisfaction, 2) reinforce personal health data security, and 3) decrease 30-day hospital readmissions, stand to win either way. Generally speaking, the digital health startup community stands to benefit more if ACOs prove to work and become universally adopted. Startups may not only benefit from ACO adoption, but they can also help to facilitate it. 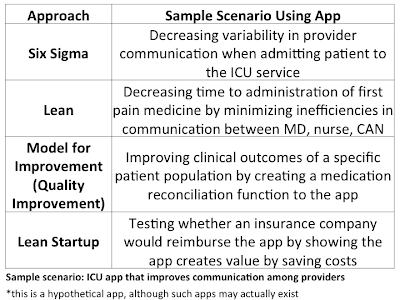 In a future post, I will explore the potential for a symbiotic relationship between ACOs and startups and how they can help one another discover value more efficiently with little capital investment if the right innovation environment can be created to minimize barriers to piloting. Healthcare reform is catalyzing a shift from quantity to quality in healthcare delivery. This change places a substantial financial burden on hospitals because of a contracture in reimbursement over the next 5-10 years. For hospitals to successfully navigate the changing financial reform, they will need to effectively balance cost cutting with new revenue generation while improving the quality of care. To achieve these objectives, hospitals will need to employ all varieties of lean thinking to eliminate inefficiencies, improve outcomes, and discover commercial value. 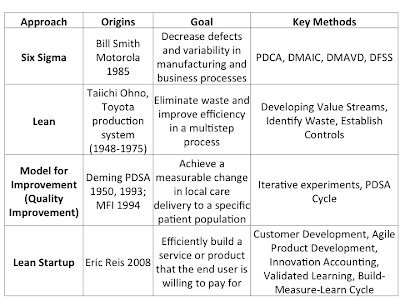 The following diagram is a comparison of the major lean approaches and how they can be applied to healthcare. No single approach can be used to solve all problems in cost-effective healthcare delivery. But the combination, particularly the last approach, lean startup, may help hospitals survive and even thrive in the changing healthcare reimbursement landscape. 2) Moen, R. and Norman, C. “Circling Back: Clearing up myths about the Deming cycle and seeing how it keeps evolving,” Quality Progress November, 2010:22-28. 3) Loyd, R & Balla G. Building an Integrated Approach to Improvement with Lean, Six Sigma and the Model for Improvement. IHI. 2012.